The final review of the budget trifecta from my club's blind tasting in March. Yes I'm getting on with it. Nose: It's rather sweet on opening, coton candy, caramel corn, then shows its youth and grain with varnish and copper smell. Rising dough, vanilla, banana chips, trail mix. There's a feeling of celery and lanolin. Finish: barrel char, heavy cream and Rhum Baba. The texture is oily but it doesn't end too sweet despite the sweet aromas. All things told, it has some interesting nuances but it's fairly rough at times strange and probably quite young. 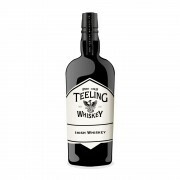 The abv which is an asset in the Teeling Single malt, is definitely highlighting the rawness. This faired decently among the group with only one person saying it didn't feel like Scotch, all agreed it was a bit rough. I think It's decent if a bit high priced compared to other Irish blends. Teeling Small Batch Four Days To St. Paddy's Day!